You have the convenience of a single serving, which makes preparation and storage easy. You can take it with you anywhere you go…vacation, gym. work, etc. With our wheatgrass, you don’t have to hassle yourself with planting the wheatgrass and juicing it every morning. And you don’t need expensive juicers and no mess to clean up after. Most of us don’t have the time or patience to do this. But with our wheatgrass, you can take your wheatgrass anywhere and take it any time with a glass of water without sacrificing the quality of your wheatgrass. In fact, you get much more from one packet of our wheatgrass than you’d normally get from freshly squeezed wheatgrass juice. The roots change the taste to that of “green tea”, and you get superior nutrition. Wheat grass is part of the cereal grass family. 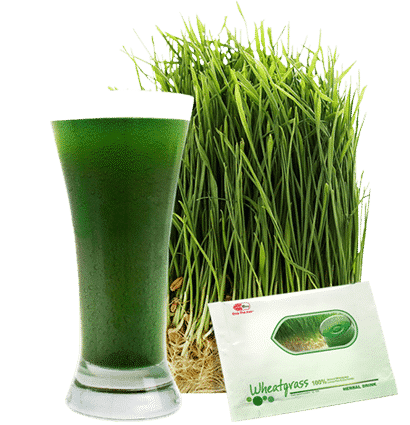 Wheat grass is known as a “live food” or “living food”. It is a high-density storehouse packed with chlorophyll, amino acids, enzymes, minerals, and vitamins and is easily assimilated in the body. It is considered a super nutrient, the premier “green super food” of nature. Our wheatgrass is grown aeroponically, which means it is not grown in soil. Indoor Organic Aeroponic Cultivation (IOAC) brings out the maximum nutrients in each plant, and is pollution free, mold free, and bacteria free through out the entire process. Because of its method of farming, our wheat grass contains both the blades and the roots, and it has more nutrients than fresh squeezed wheat grass! We are the only company in the world that includes the roots along with the blades. Why is the root of wheatgrass so important? 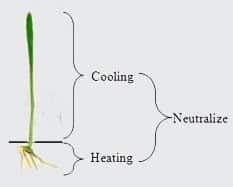 From the perspective of Chinese medicine, the leaves of wheatgrass have a cooling effect, whereas the roots produce a heating effect. Combining both characteristics neutralizes the effect produced by each individually. 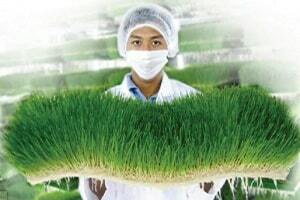 The ONLY Wheatgrass in the WORLD that combines the Leaves and Roots for Maximum Nutrition and a Milder Taste.